Nearly seven decades after the beginning of World War II, the Congressional Gold Medal—the nation’s highest civilian award—was bestowed collectively on the U.S. Army’s 100th Infantry Battalion, the 442nd Regimental Combat Team, and the Military Intelligence Service for their extraordinary accomplishments in the war. The men in these units, comprised almost entirely of persons of Japanese ancestry, fought with bravery and valor against America’s enemies on the battlefields in Europe and Asia, even while many of their parents and other family members were held in internment camps. The National Veterans Network has partnered with the Smithsonian Institution Traveling Exhibition Service, the Smithsonian’s National Museum of American History, and the Smithsonian Asian Pacific American Program to share this extraordinary story during an exclusive seven-city tour. The Congressional Gold Medal and accompanying educational app will highlight the stories of these important and honored Americans. For more information about the Congressional Gold Medal, learning resources, or to share your story, visit cgm.si.edu. For press inquiries, e-mail mediarelations@janm.org or call 213.625.0414. The Los Angeles presentation is organized by the Southern California Community Committee for the American Heroes exhibition: 100/442nd Veterans Association, Go For Broke National Education Center, Japanese American Citizens League—Pacific Southwest District, Japanese American National Museum, Military Intelligence Service Club of Southern California, and Veterans Memorial Court Alliance. American Heroes: Japanese American World War II Nisei Soldiers and the Congressional Gold Medal closes. Free! Programs will be held at 11:30AM, 1:30PM, and 3PM. Storyteller Alton Chung will perform his one-man show Heroes which tells the story of the heroic actions of the 442nd Regimental Combat Team, 100th Infantry Battalion, and the Military Intelligence Service (MIS). This program is generously sponsored by the Kazuo and Mary Yamane Family Foundation. Screenings will be held at 12PM and 2PM. Originally released by MGM in 1951, Go For Broke! tells the story of the famed 442nd Regimental Combat Team. Join us for a viewing of this classic film. This documentary tells the true World War II story of Stanley Hayami, a talented young teenager caught between his dreams of becoming an artist and his duty to his country. Based on Stanley’s diary and letters archived at the Japanese American National Museum, this coming-of-age tale chronicles Stanley’s life behind barbed wire and as a member of the 442nd Regimental Combat Team. The film captures this young man’s humor and imagination through endearing cartoons and witty observations that provide a firsthand look at the indignity of incarceration and the tragedy of war. Q&A with filmmaker and family to follow 3PM screening. Screenings to be held at 12PM and 2PM. Composed of Japanese American soldiers who were trained as linguists, the MIS were essential in helping the U.S. achieve victory in the Pacific Theater during WWII. Many of the soldiers fighting and translating on the frontlines were Nisei who had previously been incarcerated with their families in U.S. concentration camps. Q&A with MIS veteran Hitoshi Sameshima to follow 2PM screening. Former U.S. Cadet Nurse Aiko "Grace" Obata Amemiya will speak about her experiences serving in the U.S. Cadet Nurse Corps during World War II. Born and raised in Northern California, Grace was student at the University of California School of Nursing when the U.S. declared war on Japan. Like over 110,000 other Japanese Americans, Grace and her family were forcibly removed from their home and incarcerated at the Turlock Assembly Center and later at the Gila River Relocation Center. She continued to work as a nurse's aide at both Turlock and Gila River. In February 1943, Grace was able to leave camp and continue her nursing studies at St. Mary's University in Rochester, Minnesota. She was then able to enlist in the U.S. Cadet Nurse Corps and served proudly for six months at Shick General Army Hospital in Clinton, Iowa. Ms. Amemiya will speak about her service in this very special program. 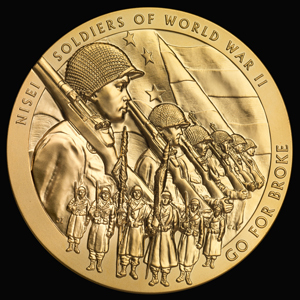 American Heroes: Japanese American World War II Nisei Soldiers and the Congressional Gold Medal opens to the public after 12PM. Writer and photographer Tom Graves will discuss and read from his new book, Twice Heroes: America's Nisei Veterans of WWII and Korea. Graves spent over a decade interviewing and photographing men and women who served to prove their loyalty to America. The veterans shared their own histories with the author, many revealing their experiences for the first time. Q&A with author to follow.